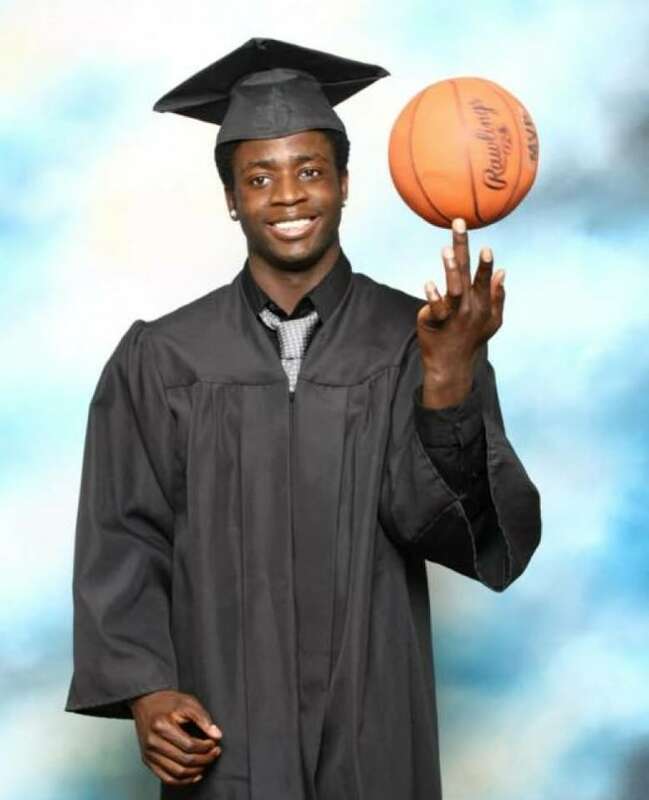 The story of Josiah Wilson, the Haiti-born, Heiltsuk First Nation adopted basketball player, has raised questions of Indigenous identity much bigger than whether he should be allowed to play in an All-Native Basketball Tournament in B.C. Can you be Indigenous without Indigenous blood? The tournament committee's decision to ban Wilson, 20, a status Indian, because he doesn't have at least 1/8th First Nations ancestry or "blood quantum" is a symptom of a greater conflict. This conflict lurks in band offices, treaty offices, on the land and on reserves across the country. What, or who, defines someone as Indigenous — is it the hereditary system, the Indian Act, a blood test? According to the Canadian government, Wilson is an "Indian." According to the Heiltsuk, he is Heiltsuk. And according to the All-Native Basketball Tournament, he is an adoptee, Canadian and Haitian, but not Heiltsuk. In the eyes of the Heiltsuk Hemas (hereditary chiefs), Wilson is Heiltsuk. The Hemas embody the Heiltsuk Nation's traditional social structure and hereditary system of governance, which identifies members through cultural protocol and a connection to family crests and clans. In the eyes of the Heiltsuk Hemas (hereditary chiefs), Josiah is Heiltsuk. 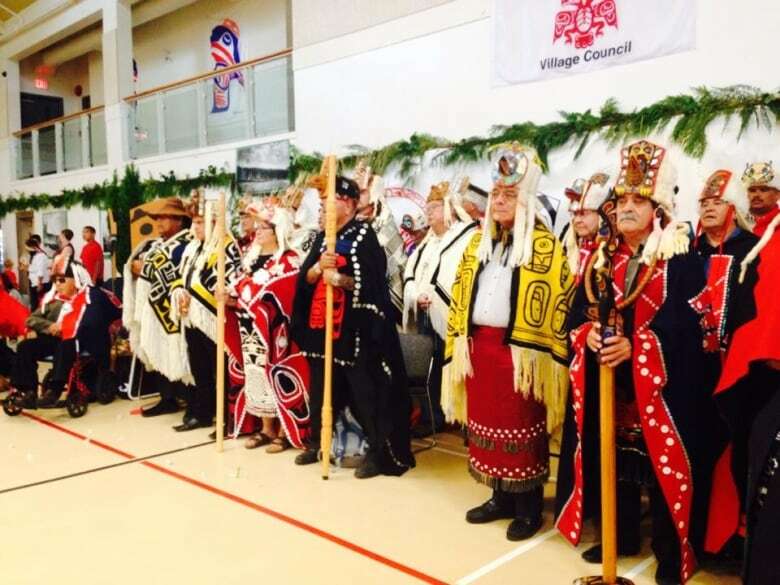 Here, Heiltsuk Hemas are shown with Haida hereditary chiefs. (Don Wilson/Facebook)Heiltsuk cultural adviser Frances Brown says the hereditary system is a complex set of laws that governs not only a responsibility to the land, but also social relationships to one another, including adoption. "If there's a customary adoption it means that you adopt a child and you do it in a potlatch where there's many witnesses and the chiefs are there," said Brown. Gary Housty was one of the Heiltsuk Hemas to witness the ceremonial adoption of Wilson by a First Nations family. He says he wrote a letter to members of the all-native committee urging them to let Wilson play, but received no response. "I really have a problem with the way they're setting down rules that disallow people to participate in these very important cultural events, such as the All-Native Tournament. There's so much culture there. And we are talking about culture here. "In my eyes Josiah is a Heiltsuk boy, a Heiltsuk person. 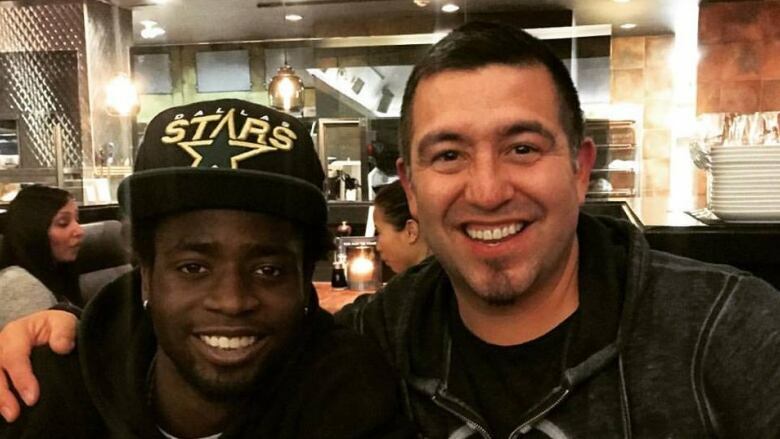 He belongs here with us," said Housty. The Indian Act is imposed by the Canadian government and identifies members by a status card, status number and having names on band lists. And while it has historically been the cause of a major identity crisis amongst Indigenous peoples — for decades, Indigenous women and their children had their status taken away for marrying non-Indigenous men — in the case of Wilson it is actually a supporting factor. Patricia Barkaskas, the academic director of the Indigenous Community Legal Clinic in Vancouver, says Wilson is a status Indian in the eyes of the federal government pursuant to Section 6 of the Indian Act, where a customary adoption can pass on Indian status from a status card-carrying parent to an adoptee, even without Aboriginal blood. But Barkaskas stresses the Heiltsuk Nation's traditional governance protocols around adoption are more important in determining Wilson's status as a Heiltsuk person. 'I love basketball,' says Josiah Wilson. 'To come after me and tell me I can't play, that really hurt me. It's probably the best feeling in the world to be up there at All-Native with my cousins, my family, playing basketball with a lot of the different tribes.' (Facebook)Wilson was banned from representing the Heiltsuk Nation at the All-Native Basketball Tournament because of blood quantum laws — the total percentage of a person's blood that is "native" due to bloodline. Blood quantum is a requirement for membership in Native American tribes in the United States, but not for Indian status in Canada. From a purely a blood perspective, Wilson is not Heiltsuk. "Blood quantum is a tricky issue. It has to do with a race-based evaluation of Indigeneity that doesn't make sense for a lot of nations. At the end of the day it has to be up to each nation, as a self-determining and sovereign entity, what their membership protocols are based on," said Barkaskas. According to a United Nations fact sheet, the top determinant for being Indigenous is "self-identification as Indigenous peoples at the individual level and accepted by the community as their member." Wilson says he is Heiltsuk because "I have a native dad, I have a status card and I've been accepted by the community." Check and check. Then again, state governments have historically opposed the Indigenous right to self-identification, as evident by the Indian Act. Jeff Corntassel, an advisor with the Indigenous Governance Program at the University of Victoria, says there is no agreed upon definition of Indigeneity. In a scholarly article, Corntassel says "a proliferation of Indigenous definitions by practitioners and academics has not fostered consensus or cumulative integration across disciplines and communities." Simply put, we don't know yet. Or rather, we can't agree yet. Being defined as Indigenous or having Indian status means you are entitled to a unique relationship with the federal government and, especially in B.C., it often means being part of a collective ownership of unceded traditional territory through Aboriginal title. If Wilson is entitled to such a relationship without Aboriginal blood, then who else is? That is what makes his case so intriguing. "There's so many layers to his identity, but it doesn't minimize any one of them. He's fully each one of those things," says his father, Don Wilson. "In my mind, he's fully Heiltsuk." Trevor Jang is a recipient of the 2016 CJF Aboriginal Journalism Fellowship. He is an award-winning writer and broadcast journalist based in Vancouver, BC. 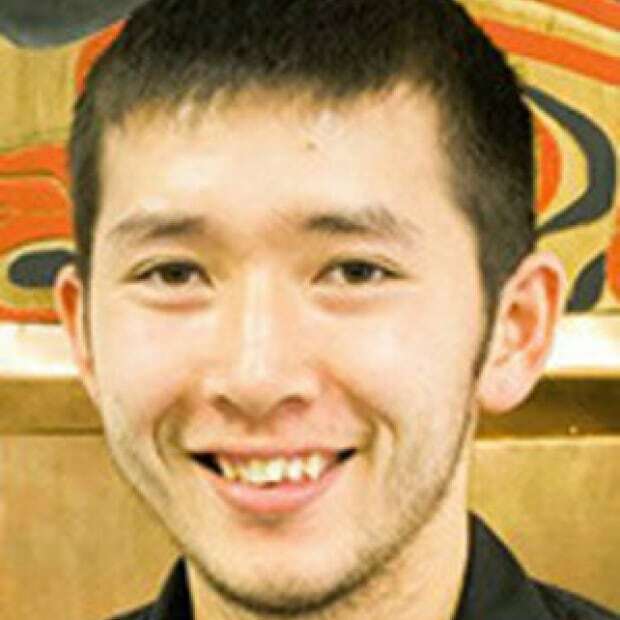 Trevor is from northwestern British Columbia and is a mix of Wet'suwet'en Nation and Chinese descent.